Neurotoxins are toxins that are poisonous or destructive to nerve tissue (causing neurotoxicity). Neurotoxins are an extensive class of exogenous chemical neurological insults that can adversely affect function in both developing and mature nervous tissue. The term can also be used to classify endogenous compounds, which, when abnormally contact, can prove neurologically toxic. 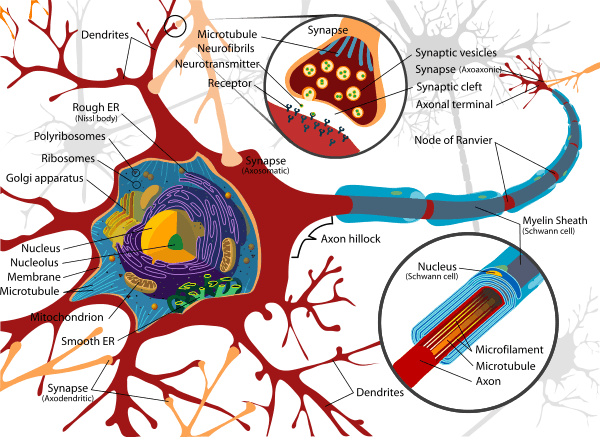 Though neurotoxins are often neurologically destructive, their ability to specifically target neural components is important in the study of nervous systems. Common examples of neurotoxins include lead, ethanol (drinking alcohol), manganese glutamate, nitric oxide (NO), botulinum toxin (e.g. Botox), tetanus toxin, and tetrodotoxin. Some substances such as nitric oxide and glutamate are in fact essential for proper function of the body and only exert neurotoxic effects at excessive concentrations. The puffer fish is a well known tetrodotoxin producer. 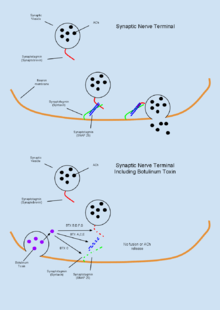 TTX-resistant (TTX-r) is another form of sodium channel which has limited sensitivity to TTX, and is largely found in small diameter axons such as those found in nociception neurons. When significant levels of TTX is ingested, it will bind sodium channels on neurons and reduce their membrane permeability to sodium. This results in an increased effective threshold of required excitatory signals in order to induce an action potential in a postsynaptic neuron. The effect of this increased signaling threshold is a reduced excitability of postsynaptic neurons, and subsequent loss of motor and sensory function which can result in paralysis and death. Though assisted ventilation may increase the chance of survival after TTX exposure, there is currently no antitoxin. The use of the acetylcholinesterase inhibitor Neostigmine or the muscarinic acetylcholine antagonist Atropine (which will inhibit parasympathetic activity), however, can increase sympathetic nerve activity enough to improve the chance of survival after TTX exposure. Ammonia toxicity is often seen through two routes of administration, either through consumption or through endogenous ailments such as liver failure. One notable case in which ammonia toxicity is common is in response to cirrhosis of the liver which results in hepatic encephalopathy, and can result in cerebral edema (Haussinger 2006). This cerebral edema can be the result of nervous cell remodeling. 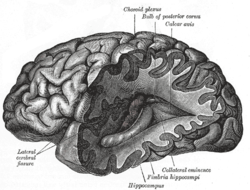 As a consequence of increased concentrations, ammonia activity in-vivo has been shown to induce swelling of astrocytes in the brain through increased production of cGMP (Cyclic Guanosine Monophosphate) within the cells which leads to Protein Kinase G-mediated(PKG) cytoskeletal modifications. The resultant effect of this toxicity can be reduced brain energy metabolism and function. Importantly, the toxic effects of ammonia on astrocyte remodling can be reduced through administration of L-carnitine. This astrocyte remodeling appears to be mediated through ammonia-induced mitochondrial permeability transition. This mitochondrial transition is a direct result of glutamine activity a compound which forms from ammonia in-vivo. Administration of antioxidants or glutaminase inhibitor can reduce this mitochondrial transition, and potentially also astrocyte remodeling. 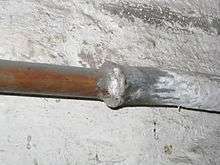 Lead pipes are common sources of ingested lead. ↑ Ben-Shachar D, Zuk R, Glinka Y (1995). "Dopamine neurotoxicity: inhibition of mitochondrial respiration". J. Neurochem. 64: 718–23. PMID 7830065. ↑ Garcia-Cairasco, N.; Moyses-Neto, M.; Del Vecchio, F.; Oliveira, J. A. C.; Dos Santos, F. L.; Castro, O. W.; Arisi, G. M.; Dantas, M. R.; Carolino, R. O. G.; Coutinho-Netto, J.; Dagostin, A. L. A.; Rodrigues, M. C. A.; Leão, R. M.; Quintiliano, S. A. P.; Silva, L. F.; Gobbo-Neto, L.; Lopes, N. P. (2013). "Elucidating the Neurotoxicity of the Star Fruit". Angewandte Chemie International Edition. 52 (49): 13067–13070. doi:10.1002/anie.201305382. Adams, Michael E.; Olivera, Baldomero M. (1994). "Neurotoxins: Overview of an Emerging Research Technology". Trends in Neuroscience. 17 (4): 151–55. doi:10.1016/0166-2236(94)90092-2. Arnon, Stephen S.; Schechter, Robert; Inglesby, Thomas V.; Henderson, Donald A.; Bartlett, John G.; Ascher, Michael S.; Eitzen, Edward; Fine, Anne D.; Hauer, Jerome; Layton, Marcelle; Lillibridge, Scott; Osterholm, Michael T.; O'Toole, Tara; Parker, Gerald; Perl, Trish M.; Russell, Philip K.; Swerdlow, David L.; Tonat, Kevin (2001). "Botulinum Toxin as a Biological Weapon". The Journal of the Americal Medical Association. 285 (8): 1059–069. Banks, William A.; Kastin, Abba J. (1989). 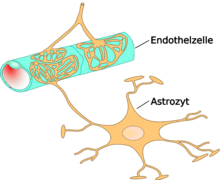 "Aluminum-Induced Neurotoxicity: Alterations in Membrane Function at the Blood-Brain Barrier". Neuroscience & Biobehavioral Reviews. 13: 47–53. doi:10.1016/s0149-7634(89)80051-x. Beckman, J. S. (1990). "Apparent Hydroxyl Radical Production by Peroxynitrite: Implications for Endothelial Injury from Nitric Oxide and Superoxide". Proceedings of the National Academy of Sciences. 87 (4): 1620–624. doi:10.1073/pnas.87.4.1620. Blanco, Ana M.; Valles, Soraya L.; Pascual, Maria; Guerri, Consuelo (2005). "Involvement of TLR4/Type I IL-1 Receptor Signaling in the Induction of Inflammatory Mediators and Cell Death Induced by Ethanol in Cultured Astrocytes". The Journal of Immunology. 175: 6893–899. doi:10.4049/jimmunol.175.10.6893. PMID 16272348. Bleich, S (2003). "Hyperhomocysteinemia as a New Risk Factor for Brain Shrinkage in Patients with Alcoholism". Neuroscience Letters. 335 (3): 179–82. doi:10.1016/s0304-3940(02)01194-1. Bradbury, MW; Deane, R. "Permeability of the blood±brain barrier to lead. [Review]". Neurotoxicology. 14: 131–6. Brender, J.; Suarez, L.; Felkner, M.; Gilani, Z.; Stinchcomb, D.; Moody, K.; Henry, J.; Hendricks, K. (2006). "Maternal Exposure to Arsenic, Cadmium, Lead, and Mercury and Neural Tube Defects in Offspring". Environmental Research. 101 (1): 132–39. doi:10.1016/j.envres.2005.08.003. Bressler, J; Kim, KA; Chakraborti, T; Goldstein, G (1999). "Molecular mechanisms of lead neurotoxicity. [Review]". Neurochem Res. 24: 595–600. Brocardo, Patricia S.; Gil-Mohapel, Joana; Christie, Brian R. (2011). "The Role of Oxidative Stress in Fetal Alcohol Spectrum Disorders". Brain Research Reviews. 67 (1–2): 209–25. doi:10.1016/j.brainresrev.2011.02.001. Buzanska, L.; Zablocka, B.; Dybel, A.; Domanska-Janik, K.; Albrecht, J. (2000). "Delayed Induction of Apoptosis by Ammonia in C6 Glioma Cells". Neurochemistry International. 37: 287–97. doi:10.1016/s0197-0186(00)00030-9. Carmichael WW, Gorham PR (1978). "Anatoxins from clones of Anabaena flos-aquae isolated from lakes of western Canada.". Mitt. Infernal. Verein. Limnol. 21: 285–295. Choi, Dennis W (1987). "Ionic Dependence of Glutamate Neurotoxicity". The Journal of Neuroscience. 7 (2): 369–79. Chowdhury, F. R.; Ahasan, H A M. Nazmul; Rashid, A K M. Mamunur; Mamun, A. Al; Khaliduzzaman, S. M. (2007). "Tetrodotoxin Poisoning: a Clinical Analysis, Role of Neostigmine and Short-term Outcome of 53 Cases". Singapore Medical Journal. 48 (9): 830–33. Choi, Dennis W.; Maulucci-Gedde, Margaret; Kriegstein, Arnold R. (1987). "Glutamate Neurotoxicity in Cortical Cell Culture". The Journal of Neuroscience. 7 (2): 357–68. Chu, Jennifer; Tong, Ming; Monte, Suzanne M. (2007). "Chronic Ethanol Exposure Causes Mitochondrial Dysfunction and Oxidative Stress in Immature Central Nervous System Neurons". Acta Neuropathologica. 113 (6): 659–73. doi:10.1007/s00401-007-0199-4. Clancy, Barbara; Finlay, Barbara L.; Darlington, Richard B.; Anand, K.J.S. (2007). "Extrapolating Brain Development from Experimental Species to Humans". NeuroToxicology. 28 (5): 931–37. doi:10.1016/j.neuro.2007.01.014. Davis, S.; Butcher, S. P.; Morris, R. (1992). "The NMDA Receptor Antagonist D-2-amino-5phosphonopentanoate (D-AP5) Impairs Spatial Learning and LTP in Vivo at Intracerebral Concentrations Comparable to Those That Block LTP in Vitro". The Journal of Neuroscience. 12 (1): 21–34. Dawson, V. L. (1991). "Nitric Oxide Mediates Glutamate Neurotoxicity in Primary Cortical Cultures". Proceedings of the National Academy of Sciences. 88 (14): 6368–371. doi:10.1073/pnas.88.14.6368. DeFuria, Jason; Shea, Thomas B. (2007). "Arsenic Inhibits Neurofilament Transport and Induces Perikaryal Accumulation of Phosphorylated Neurofilaments: Roles of JNK and GSK-3β.". Brain Research. 1181: 74–82. doi:10.1016/j.brainres.2007.04.019. Deshane, Jessy; Garner, Craig C.; Sontheimer, Harald (2003). "Chlorotoxin Inhibits Glioma Cell Invasion via Matrix Metalloproteinase-2". The Journal of Biological Chemistry. 278 (6): 4135–144. doi:10.1074/jbc.m205662200. Dixit A, Dhaked RK, Alam SI, Singh L (2005). "Military potential of biological neurotoxins". Informa Healthcare. 24 (2): 175–207. doi:10.1081/TXR-200057850. Dutertre, S.; Lewis, R. (2006). "Toxin Insights into Nicotinic Acetylcholine Receptors". Biochemical Pharmacology. 72 (6): 661–70. doi:10.1016/j.bcp.2006.03.027. Garcia-Rodriguez, C.; Geren, I. N.; Lou, J.; Conrad, F.; Forsyth, C.; Wen, W.; Chakraborti, S.; Zao, H.; Manzanarez, G.; Smith, T. J.; Brown, J.; Tepp, W. H.; Liu, N.; Wijesuriya, S.; Tomic, M. T.; Johnson, E. A.; Smith, L. A.; Marks, J. D. (2011). "Response Re: 'Neutralizing Human Monoclonal Antibodies Binding Multiple Serotypes of Botulinum Neurotoxin' by Garcia-Rodriguez Et Al., PEDS, 2011;24:321–331". Protein Engineering Design and Selection. 24 (9): 633–34. Garthwaite, John; Charles, Sarah L.; Chess-Williams, Russel (1988). 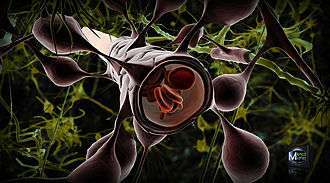 "Endothelim-derived Relaxing Factor Release on Activation of NMDA Receptors Suggests Role as Intercellular Messenger in the Brain". Nature. 336 (24): 385–88. Gartlon, J.; Kinsner, A.; Balprice, A.; Coecke, S.; Clothier, R. (2006). "Evaluation of a Proposed in Vitro Test Strategy Using Neuronal and Non-neuronal Cell Systems for Detecting Neurotoxicity". Toxicology in Vitro. 20 (8): 1569–581. doi:10.1016/j.tiv.2006.07.009. Griffith, Harold R.; Johnson, G. Enid (1942). "The Use Of Curare In General Anesthesia". Anesthesiology. 3 (4): 418–420. doi:10.1097/00000542-194207000-00006. Haghdoost-Yazdi, Hashem; Faraji, Ayda; Fraidouni, Negin; Movahedi, Mohadeseh; Hadibeygi, Elham; Vaezi, Fatemeh (2011). "Significant Effects of 4-aminopyridine and Tetraethylammonium in the Treatment of 6-hydroxydopamine-induced Parkinson's Disease". Behavioural Brain Research. 223: 70–74. doi:10.1016/j.bbr.2011.04.021. Harry, G. J.; Billingsley, Melvin; Bruinink, Arendd; Campbell, Iain L.; Classen, Werner; Dorman, David C.; Galli, Corrado; Ray, David; Smith, Robert A.; Tilson, Hugh A. (1998). "In Vitro Techniques for the Assessment of Neurotoxicity". Environmental Health Perspectives. 106: 131–58. doi:10.2307/3433917. Heaton; Barrow, Marieta; Mitchell, J. Jean; Paiva, Michael (2000). "Amelioration of Ethanol-Induced Neurotoxicity in the Neonatal Rat Central Nervous System by Antioxidant Therapy". Alcoholism: Clinical and Experimental Research. 24 (4): 512–18. doi:10.1111/j.1530-0277.2000.tb02019.x. Hensley, K (1994). "A Model for β-Amyloid Aggregation and Neurotoxicity Based on Free Radical Generation by the Peptide: Relevance to Alzheimer Disease". Proceedings of the National Academy of Sciences. 91 (8): 3270–274. doi:10.1073/pnas.91.8.3270. Hue, Bernard; Buckingham, Steven D.; Buckingham, David; Sattelle, David B. (2007). 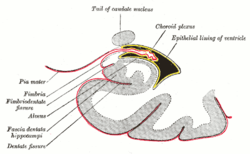 "Actions of Snake Neurotoxins on an Insect Nicotinic Cholinergic Synapse". Invertebrate Neuroscience. 7 (3): 173–78. doi:10.1007/s10158-007-0053-3. Jacob, Reed B.; McDougal, Owen M. (2010). "The M-superfamily of Conotoxins: a Review". Cellular and Molecular Life Sciences. 67: 17–27. doi:10.1007/s00018-009-0125-0. Jevtovic-Todorovic, Vesna; Hartman, Richard E.; Izumi, Yukitoshi; Benshoff, Nicholas D.; Dikranian, Krikor; Zorumski, Charles F.; Olney, John W.; Wozniak, David F. (2003). "Early Exposure to Common Anesthetic Agents Causes Widespread Neurodegeneration in the Developing Rat Brain and Persistent Learning Deficits". The Journal of Neuroscience. 23 (3): 876–82. Jones, K (1973). 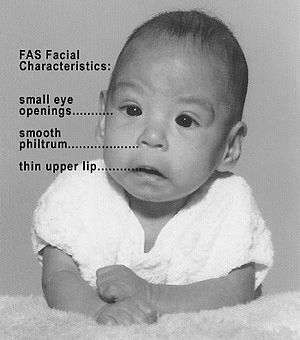 "Pattern Of Malformation In Offspring Of Chronic Alcoholic Mothers". The Lancet. 301 (7815): 1267–271. doi:10.1016/s0140-6736(73)91291-9. Kiernan, Matthew C.; Isbister, Geoffrey K.; Cindy; Lin, S.-Y. ; Burke, David; Bostock, Hugh (2005). "Acute Tetrodotoxin-induced Neurotoxicity after Ingestion of Puffer Fish". Annals of Neurology. 57 (3): 339–48. doi:10.1002/ana.20395. King, Steven W.; Savory, John; Wills, Michael R.; Gitelman, H. J. (1981). "The Clinical Biochemistry of Aluminum". Critical Reviews in Clinical Laboratory Sciences. 14 (1): 1–20. doi:10.3109/10408368109105861. Konopacka, Agnieszka; Konopacki, Filip A.; Albrecht, Jan (2009). "Protein Kinase G Is Involved in Ammonia-induced Swelling of Astrocytes". Journal of Neurochemistry. 109: 246–51. doi:10.1111/j.1471-4159.2009.05802.x. Lafon-Cazal, Mireille; Pietri, Sylvia; Culcasi, Marcel; Bockaert, Joel (1993). "NMDA-dependent Superoxide Production and Neurotoxicity". Nature. 364 (6437): 535–37. doi:10.1038/364535a0. Lasley, SM; Green, MC; Gilbert, ME (1999). "Influence of exposure period on in vivo hippocampal glutamate and GABA release in rats chronically exposed to lead". Neurotoxicology. 20: 619–29. Leonard, B. E. (1986). "Is Ethanol a Neurotoxin? : the Effects of Ethanol on Neuronal Structure and Function". Alcohol and Alcoholism. 21 (4): 325–38. Lewendon, G.; Kinra, S.; Nelder, R.; Cronin, T. (2001). "Should Children with Developmental and Behavioural Problems Be Routinely Screened for Lead?". Archives of Disease in Childhood. 85: 286–88. doi:10.1136/adc.85.4.286. Liu, Kuang-Kai; Chen, Mei-Fang; Chen, Po-Yi; Lee, Tony J F.; Cheng, Chia-Liang; Chang, Chia-Ching; Ho, Yen-Peng; Jui-I, Chao (2010). "Alpha-bungarotoxin Binding to Target Cell in a Developing Visual System by Carboxylated Nanodiamond". Nanotechnology. 19 (20): 205102. Liu, Yuan; McDermott, Suzanne; Lawson, Andrew; Aelion, C. Marjorie (2010). "The Relationship between Mental Retardation and Developmental Delays in Children and the Levels of Arsenic, Mercury and Lead in Soil Samples Taken near Their Mother's Residence during Pregnancy". International Journal of Hygiene and Environmental Health. 213 (2): 116–23. doi:10.1016/j.ijheh.2009.12.004. Lovinger, D.; White, G.; Weight, F. "Ethanol Inhibits NMDA-activated Ion Current in Hippocampal Neurons". Science. 243 (4899): 1721–724. doi:10.1126/science.2467382. Martinez-Finley, Ebany J.; Goggin, Samantha L.; Labrecque, Matthew T.; Allan, Andrea M. (2011). "Reduced Expression of MAPK/ERK Genes in Perinatal Arsenic-exposed Offspring Induced by Glucocorticoid Receptor Deficits". Neurotoxicology and Teratology. 33 (5): 530–37. doi:10.1016/j.ntt.2011.07.003. Matsuoka, Masato; Igisu, Hideki; Kohriyama, Kazuaki; Inoue, Naohide (1991). "Suppression of Neurotoxicity of Ammonia by L-carnitine". Brain Research. 567 (2): 328–31. doi:10.1016/0006-8993(91)90814-c.
McCleskey, E. W. (1987). "Omega-conotoxin: Direct and Persistent Blockade of Specific Types of Calcium Channels in Neurons but Not Muscle". Proceedings of the National Academy of Sciences. 84 (12): 4327–331. doi:10.1073/pnas.84.12.4327. Norenberg, M. D.; Rao, K. V. Rama; Jayakumar, A. R. (2004). "Ammonia Neurotoxicity and the Mitochondrial Permeability Transition". Journal of Bioenergetics and Biomembranes. 36 (4): 303–07. doi:10.1023/b:jobb.0000041758.20071.19. Olney, John W (2002). "New Insights and New Issues in Developmental Neurotoxicology". NeuroToxicology. 23 (6): 659–68. doi:10.1016/s0161-813x(01)00092-4. Radio, Nicholas M.; Mundy, William R. (2008). "Developmental Neurotoxicity Testing in Vitro: Models for Assessing Chemical Effects on Neurite Out-growth". NeuroToxicology. 29: 361–276. doi:10.1016/j.neuro.2008.02.011. Rocha, R. A.; Gimeno-Alcaniz, J. V.; Martín-Ibanez, Raymond; Canals, J. M.; Vélez, D.; Devesa, V. (2011). "Arsenic and Fluoride Induce Neural Progenitor Cell Apoptosis". Toxicology Letters. 203: 237–44. doi:10.1016/j.toxlet.2011.03.023. Rosales, Raymond L.; Arimura, Kimiyoshi; Takenaga, Satoshi; Osame, Mitsuhiro (1996). "Extrafusal and Intrafusal Muscle Effects in Experimental Botulinum Toxin-A Injection". Muscle & Nerve. 19 (4): 488–96. doi:10.1002/(sici)1097-4598(199604)19:4<488::aid-mus9>3.0.co;2-8. Schlesinger, Edward B (1946). "Curare A Review of Its Therapeutic Effects and Their Physiological Basis". The American Journal of Medicine. 1 (5): 518–30. Sivonen, K (1999). "Toxins produced by cyanobacteria". Vesitalous. 5: 11–18. Stewart I, Seawright AA, Shaw GR (2008). "Cyanobacterial poisoning in livestock, wild mammals and birds – an overview" (PDF). Cyanobacterial Harmful Algal Blooms: State of the Science and Research Needs. Advances in Experimental Medicine and Biology. 619: 613–637. doi:10.1007/978-0-387-75865-7_28. ISBN 978-0-387-75864-0. Taffe, M. A.; Kotzebue, R. W.; Crean, R. D.; Crawford, E. F.; Edwards, S.; Mandyam, C. D. (2010). "From the Cover: Long-lasting Reduction in Hippocampal Neurogenesis by Alcohol Consumption in Adolescent Nonhuman Primates". Proceedings of the National Academy of Sciences. 107 (24): 11104–1109. doi:10.1073/pnas.0912810107. PMC 2890755 . PMID 20534463. Takadera, Tsuneo; Suzuki, Risa; Mohri, Tetsuro (1990). "Protection by Ethanol of Cortical Neurons from N-methyl-d-aspartate-induced Neurotoxicity Is Associated with Blocking Calcium Influx". Brain Research. 537 (1–2): 109–14. doi:10.1016/0006-8993(90)90346-d.
Thyagarajan, B.; Krivitskaya, N.; Potian, J. G.; Hognason, K.; Garcia, C. C.; McArdle, J. J. (2009). "Capsaicin Protects Mouse Neuromuscular Junctions from the Neuroparalytic Effects of Botulinum Neurotoxin A.". Journal of Pharmacology and Experimental Therapeutics. 331 (2): 361–71. doi:10.1124/jpet.109.156901. Tsetlin, V.I; Hucho, F. (2004). "Snake and Snail Toxins Acting on Nicotinic Acetylcholine Receptors: Fundamental Aspects and Medical Applications". FEBS Letters. 557 (1–3): 9–13. doi:10.1016/s0014-5793(03)01454-6. Williamson, Lura C.; Halpern, Jane L.; Montecucco, Cesare; Brown, J. E.; Neale, Elaine A. (1996). "Clostridial Neurotoxins and Substrate Proteolysis in Intact Neurons". The Journal of Biological Chemistry. 271 (13): 7694–699. Yamada, Kiyofumi; Tanaka, Tomoko; Han, Daiken; Senzaki, Kouji; Kameyama, Tsutomu; Nabeshima, Toshitaka (1999). "Protective Effects of Idebenone and α-tocopherol on β-amyloid-(1–42)-induced Learning and Memory Deficits in Rats: Implication of Oxidative Stress in β-amyloid-induced Neurotoxicity In vivo". European Journal of Neuroscience. 11 (1): 83–90. doi:10.1046/j.1460-9568.1999.00408.x. Yan; Du, Shi; Chen, Xi; Fu, Jin; Chen, Ming; Zhu, Huaijie; Roher, Alex; Slattery, Timothy; Zhao, Lei; Nagashima, Mariko; Morser, John; Migheli, Antonio; Nawroth, Peter; Stern, David; Marie Schmidt, Ann (1996). "RAGE and Amyloid-β Peptide Neurotoxicity in Alzheimer's Disease". Nature. 382 (6593): 685–91. doi:10.1038/382685a0.